The Klatooinian Barada was enslaved to the Hutt crime lord Jabba Desilijic Tiure four years after the Battle of Yavin. He worked as a mechanic in Jabba’s Palace on Tatooine, and was responsible for the gangster’s pool of repulsorlift vehicles, which included his sail barge Khetanna, in addition to serve as muscle. Despite his enforced servitude, Barada remained relatively content with his lot in the palace. Barada was in the Hutt’s employ when Jabba was in possession of the smuggler Han Solo frozen in carbonite. Solo’s companions in the Alliance to Restore the Republic hoped to rescue their comrade, planting some of their number in Jabba’s court: Princess Leia Organa, and then Jedi Knight Luke Skywalker, both attempted to free Solo, but ended up Jabba’s captives along with the Wookiee Chewbacca. After Jabba’s Rancor failed to kill Skywalker, the crime lord demanded that Solo, Skywalker and Chewbacca all be executed at the Great Pit of Carkoon, where they would be fed to the Sarlacc. Barada was among the henchmen Jabba assigned to ride in a secondary skiff, to travel alongside the skiff carrying the prisoners to the pit. Once at the pit, Skywalker’s astromech droid R2-D2, who was serving in Jabba’s court, armed the Jedi with his lightsaber, which he used to quickly slay all of the henchmen on the skiff with him. The Jedi then leaped across to the vehicle carrying Barada, and killed a number of the men on it before the Klatooinian attacked him. Skywalker dodged the blow and slashed at Barada, knocking him into the pit of the Sarlacc. The Rebels went on to slay Jabba and destroy his sail barge, killing many other members of his court in the process and escaping. Languishing in the Pit of Carkoon, Barada would be slowly digested by the Sarlacc over the next thousand years. How did you get into the line of stunt work? I was lucky to be at the right place at the right time. Can you describe what it was like working in the Barada costume? What was it like working on the Sarlacc Pit? 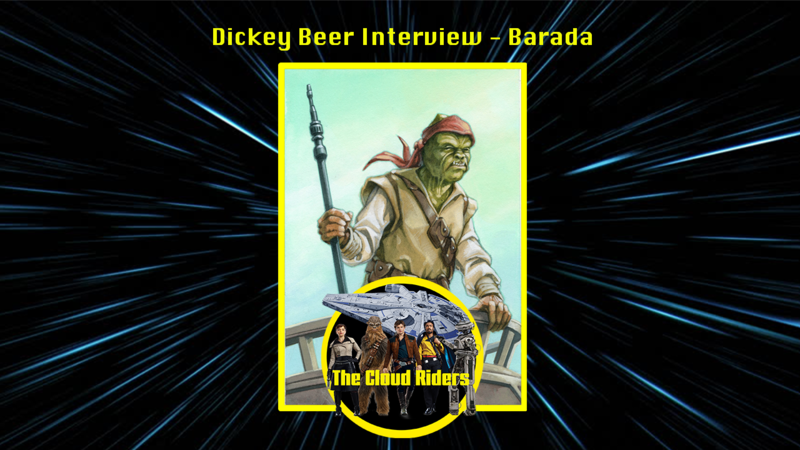 Barada was one of the characters who fell in to the pit, how much of a drop was there, and how many times did you have to fall? I was one of the 2 Stunt Performers who did the fall from the Skiffs straight into the Pit, I did that fall about 10 times as different characters. The fall was 45 feet into a 10 feet wide pit. Do you have any preference between being behind the camera and actually doing the stunts? Behind the camera or in front its all fun to do, My job is the best in the world. Were you prepared for the fandom that came with being in a Star Wars film, and how would you describe the Star Wars fans? One day my Daughter came home from school, she was 10 at the time, and told me that I was famous, I said what are you talking about, then she said, But you were Boba Fett, and I said, who the hell is Boba Fett. That’s how prepared I was. You also played a Biker Scout in Return of the Jedi; can you describe that experience? I was a Biker Scout , Stormtrooper, Rebel Soldier, Barada, Gamorrean Guard, Boba Fett, and Stunt Double for Luke Skywalker, all just another job in another costume. How many Ewok’s do you think there were actually was on set? I think we had about 50 or 75 Ewok’s on set.